Summary: The Dream Thieves is book 2 of The Raven Cycle, and will contain spoilers for the first book of the series, The Raven Boys. For my review of The Raven Boys, please click here. Ronan Lynch, dark and dangerous, has a secret. His secret is that he can bring things back from dreams and make them real. But he's not the only one with secrets. And he's not the only one with this particular secret. 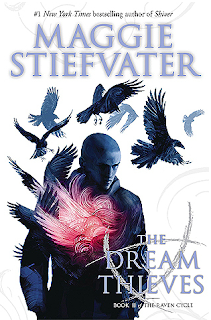 As hit men and bounty hunters converge on Henrietta to find the Greywaren (the object that can bring things back from dreams), Ronan is being both hunted and haunted by his ability. In the meantime, Gansey continues his quest to find Glendower, the lost Welsh king. But his friendship with the others grows complicated, as Ronan dives deeper into his ability and his family history, Adam learns what it truly means to be the one who has awakened the ley line, and Blue learns that there is no fighting the psychic prophecy about Gansey. Thoughts: I feel like my summary above pales in comparison to the actual story, for both books of the series so far, actually. Maggie Stiefvater has created this very full, rich world, which is amazing, because while physically, the world is just Henrietta, Georgia, the world of Aglionby, the group of "Raven boys," and the psychics is created SO well that at times I found myself wanting to be among them: "In that moment, Blue was a little in love with all of them. Their magic. Their quest. Their awfulness and strageness. Her raven boys." Stiefvater's style of narration is SO to my taste (in tone, language, and humor), and her character-building is so layered and dynamic that I was really won over by each of the main characters. They're all charming in their way, even Ronan, who was my least favorite (to be honest). It took me a while to read this one BECAUSE I was least interested in Ronan--I'm not into tattooed guys who are "elegant and dangerous" and cruel. But his story is interesting, and as we see more and more of his humanity, it was hard NOT to feel invested in his arc. Ronan is definitely an anti-hero. And while this book did focus a lot on Ronan, it did not feel like "the Ronan installment," like an X-Files "monster of the week" episode. It was all still part of the larger plot of the series, and I appreciated that, because I would've been really disappointed if we didn't get any further developments on Blue and the other guys in the group. I really loved the exploration of all their relationships with Gansey (except Noah, really, who is dead), and how their group dynamics change throughout the course of the story. There are a couple new characters in the forefront of this story, and while I don't want to spoil anything, I have to say that the direction that was taken with both of them was both surprising and fascinating. There are two more books in the series, and I am ready to start the next one immediately! I can't wait to see how things turn out.